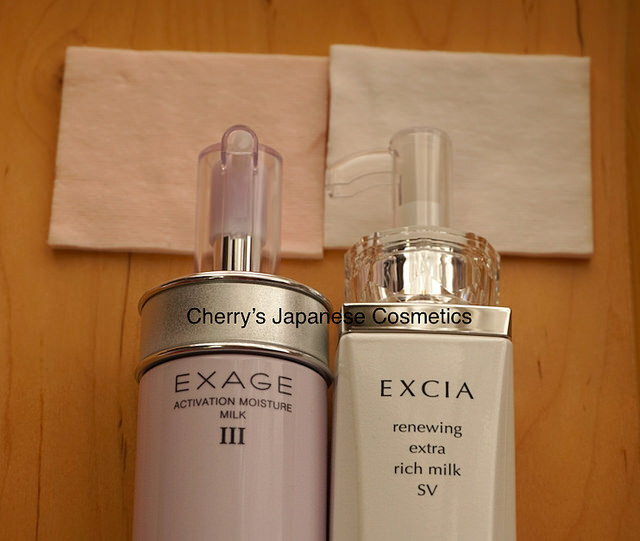 In this time, I compare Exage Activation Moisture Milk 3 and Excia AL Renewing Extra Rich Milk. Still I feel my skin is so dry, I need to focus on make my skin moisturized. My preference is lighter texture, but as I know, both are “rich”. Quite rich and when my skin condition is good, I feel both are too much. But in this condition, they may better, I thought. I often apply albion milks by my hands (see also: Are Cottons are Essential? ), but in this time, to compare, I use cottons 🙂 I suggest use cottons or not as your preference. The texture looks nearer, oilier “rich” items. If you are an oil prone, I never recommend this for you. My skin texture afterward, just after applied, I felt they are not pretty big difference, they are oily and sticky. I did not use any lotions or creams after the milk on that time, Exage is coming to smoother sooner, but Excia AL Extra Rich Milk SV needed extra few mins. I feel Excia AL ER is more richer than Exage 3. If you need quicker to get smoother, my suggestion is Infiness. Still I feel my skin is enough supple, and I can not say which are good for dull skin. I felt, Excia AL ER is better to make moisturized, I felt my skin need some oil now. Oops! Seems I forgot to write a review of comparison of Excia AL Renewing Extra Rich/ Rich Milk SV? Anyway, there are few samples of Excia AL Renewing Rich Milk SV too. Let me compare Exage Activation Moisture Milk #3 and Renewing Rich Milk. The texture themselves are not pretty much different each other. The perfumes are different, of course. My skin afterward, I also could not feel so much different from Rich Milk SV and Extra Rich Milk SV. Exage #3 was quicker to be smooth than Rich Milk SV. I also felt Rich Milk SV is a little bit richer, aka oilier than Exage #3. So, for me, at least this skin condition, I felt Excia AL Renewing Extra Rich Milk SV and Rich Milk SV are oilier than Exage #3. Pingback: How to choose Albion Exage, Infinesse and Excia AL? | Cherry's Japanese Cosmetics | We Ship Japanese High Quality Cosmetics as your order.